So what do you get if you cross a Big Green Egg and applewood? This product is certainly no joke; a beef jerky so moreish you would think Harry Potter and the Hogwarts clan spent hours shouting at their wands to come up with a product so magical. 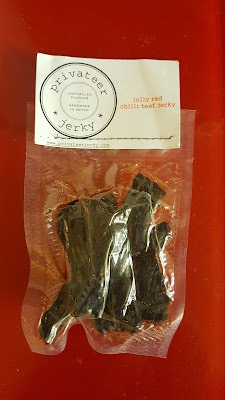 As I tuck into a bag of Jolly Red Chilli Beef Jerky, the whole product screams quality; from the hand stitched label, showing the unbelievable small amount of ingredients used to make this jerky to the clear bag showing off the contents (by the way, anyone thinking of making a product like this, a clear bag is a great way to show it off). The first thing you get when you open a bag is the intense aroma of smoke, and believe me, this is not unpleasant - far from it; it's the sweetest, fruitiest, smokiest smell to have ever come out of a bag. In fact, if Vaughan, the genius behind the jerky ever just sold smoke in a bag...I would buy it! The jerky itself is rich and dark in colour, handcut to perfection, chewy but certainy not tough to eat - although if you give some to your granny tell her to remove her false teeth. With the addition of chillis supplied by the Dartmoor Chilli Farm, this has a good heat to it but not so spicy that it will make you weep. Vaughan, who I have met many times now, comes across as a humble guy who just makes jerky - but the truth is, he lovingly hand slices his local beef, saws the applewood from his garden and uses local charcoal. The man's a genius; using just a Big Green Egg, he has made the best jerky you can buy. You can buy jerky in a supermarket from 85p now, where this will cost you £4.00 for a similar size bag, but there is absolutly no comparison whatsoever. It's like a pot of caviar, or a michelin starred plate of food - you savour every morsel so in fact this little parcel gives great pleasure and value for money. His products are gluten free and 50% protein, so lean and healthy! Would I recommend Privateer Jerky? Big time! If you want jerky that's made with passion and is a culmination of all things local, please don't be a muggle and buy the mass produced stuff - support a passionate, artisan producer standing at the bottom of the garden doing his thing, and doing it smokingly well. 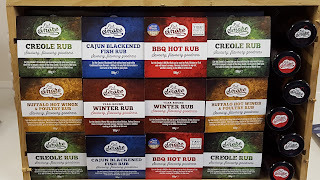 Go to Privateer Jerky where you will find the whole range, all as good as this one by the way! 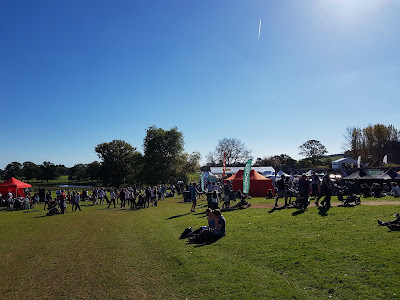 Or go find Vaughan at a food festival around the county, don't hang around though, this sells out fast!